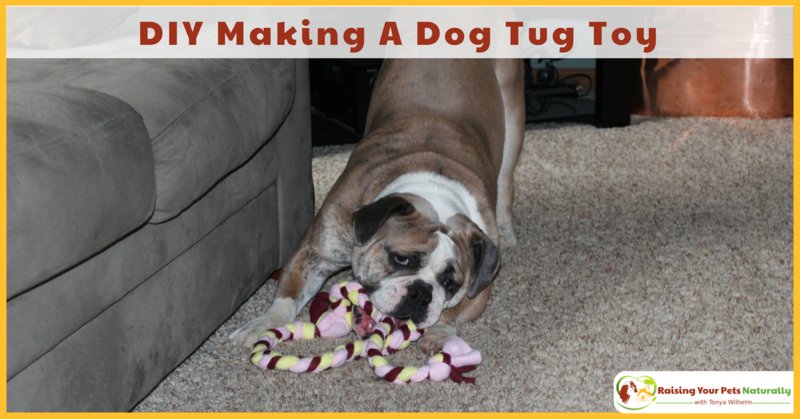 I recently posted a blog post on how to play tug with your dog. Next, I’m going to show you an easy way to make a fleece dog tug if you would rather not purchase one. 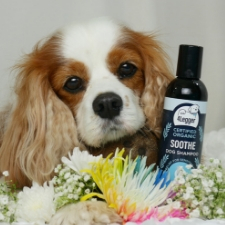 As you can see the items needed to make quality fleece dog tugs are very minimal! 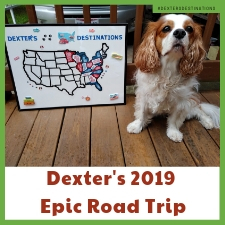 All you must have is Fleece and a pair of Scissors, and you are on your way. The Carabiner Clip, Cutting Mat, Rotary Cutter, and Lip Edge Ruler just make it easier, especially if you intend on making a lot of dog tugs. 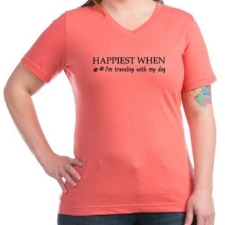 They make great gifts and prizes! 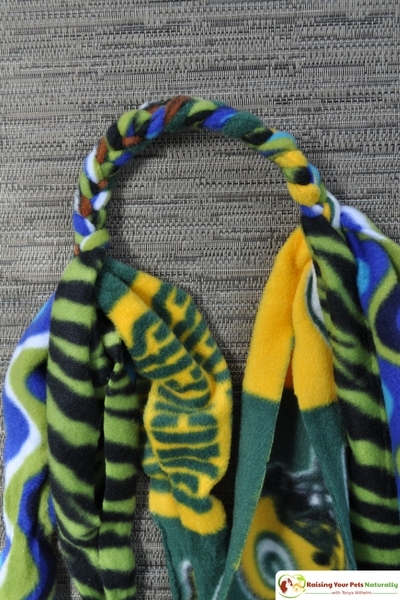 First, I will teach you how to make a single fleece tug that is about 27 inches long and 1 inch thick. Your fabric can be any kind of Fleece, even remnants! They can be the same fabric for your ties or different, it really doesn’t matter unless maybe you are going to sell them or give them as gifts. Or if you are trying to be eco-friendly, they do make ECO Hemp Organic Cotton Fleece Fabric. 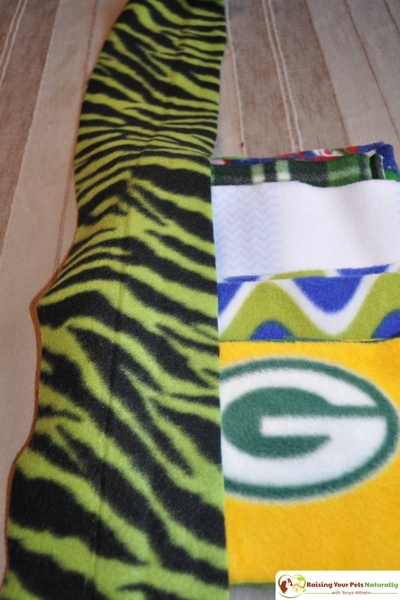 You will want to cut 3 pieces of fleece that are approximately 5″ wide by 28″ long. You will want the length to be the part of the fabric that stretches. Give it a gentle tug before cutting to ensure the length will have the stretch. You can either eyeball it and cut each piece of Fleece with your Scissors, or you can use a Cutting Mat, Rotary Cutter, and Lip Edge Ruler for more precise cuts or if you are making more than one at a time. A great investment if you plan on making more. 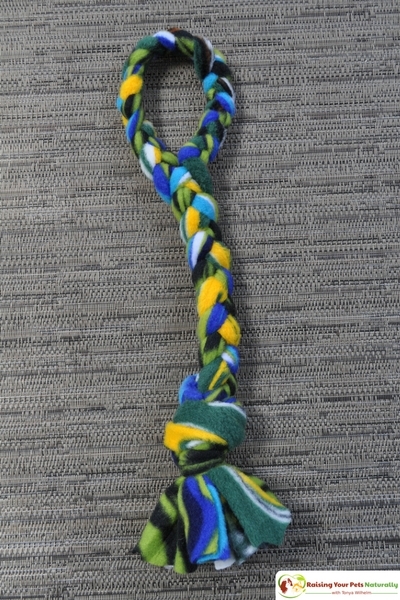 Tie one end in a knot. 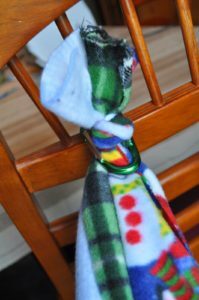 If you like, attach a Carabiner Clip to the end of the knot and clip it to something like a chair. Or, if you are like me, you can put the knot between your big toe and second toe and hold! 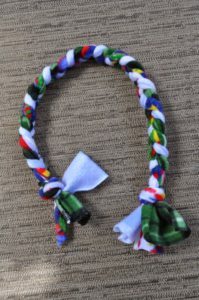 You are looking for a way to be able to give the fleece a little tug in between each braid. Fold each piece in half length-wise to double the thickness. Now it’s time to start braiding the fleece! Rather than try to write instructions, I found this nice video on how to braid. It’s pretty straightforward. You will want to leave enough fabric at the end to tie another knot. Afterward, I typically trim the ends to be even. Voila! 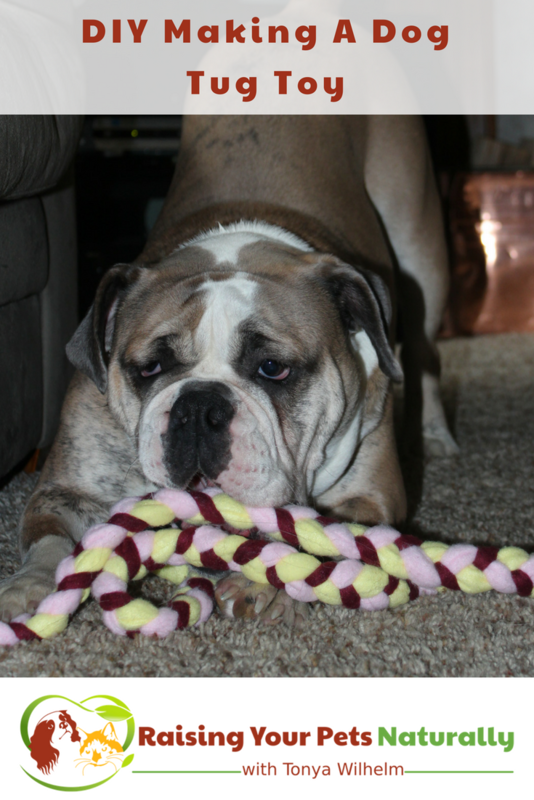 Your first quality dog tug toy is complete. 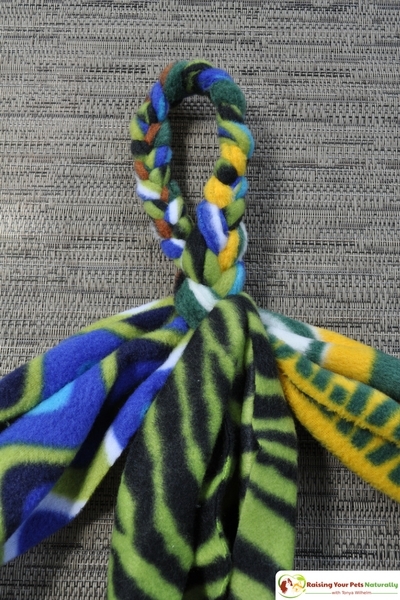 If you want to make a fleece tug with a looped handle, that is pretty simple too. Set up the same as previously, but this time cut your Fleece about 36″ long. Do not tie a knot. This time start your braid from the CENTER of your fabric and braid about 5″ to each side of the center. After you get the center braided (the handle), bring the ends together (3 from one side, 3 from the other) and combine them in pairs so you have 3 doubled parts to continue your braid. Braid the parts together (remember to make each braid taut), and tie on the end. Voila! Your first quality dog tug with a handle is complete. 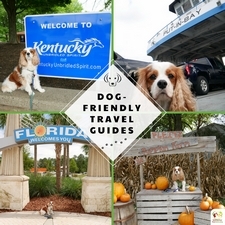 Thanks to Kelly for Photography by Kelly & Kelly LLC for the shots of Kirby and his tug toy! 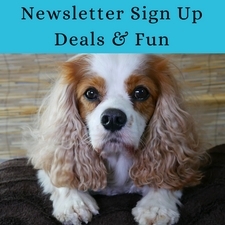 Have you ever made your dog or cat a DIY pet toy? Tell me in the comments. Sure thing! We have many laying around. Lots of different sizes and shapes.